A number of specialty gasses play a prominent role in semiconductor fabrication. These gasses may be used to clean the silicon substrates, and to etch and process the silicon wafers. It is critical during the fabrication process that each of the gasses be available when needed. An entire batch of wafers, which can represent thousands of dollars of finished product, can be ruined if any single item is missing. In order to store a significant amount of the gas, it is often pressurized, liquefied and stored in a high pressure tank or dewar. Valves are then used to dispense the gas in the order, and in the amount that is required. It is necessary to monitor the amount of gas remaining. While measuring the gas pressure may be the least expensive and most convenient method, it is also thoroughly inaccurate. Liquefied gas boils into the gaseous state and then dispensed. Therefore, the gas pressure will remain constant as long as there is liquid remaining. As soon as the last of the liquid boils off, the gas pressure will decrease to zero. There will be no warning that the liquid content is nearing the empty point. The only practical means of accurately measuring the contents of gas remaining is to weigh the entire cylinder. After compensating for the weight of the cylinder itself, the scale reading will show the amount of liquefied gas remaining. Typically, an electronic scale will be used for this purpose. The output of the scale is often tied into other processing equipment, which is used to alert the operator of the condition of the cylinder. Fabrication facilities are generally very difficult environments. One of the common gasses used is liquefied chlorine. This material can be very harsh on the surrounding equipment. For this reason, the platform scales that hold the gas cylinder should be manufactured from stainless steel. The weight of a full canister can be more than one ton. So the electronic scale capacity must be quite high. Cylinder scales used for this purpose supplied by Arlyn Scales have capacities of more than 3000 lb. Some of the most difficult environmental issues that are often found in a facility are various types of electronic interference, including both electromagnetic and radio frequency interference. This may be caused by a wide variety of process and communication equipment. 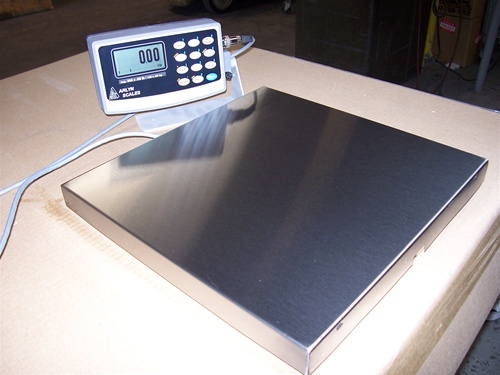 Electronic scales are generally very sensitive to all types of electronic noise. Load sensors on the scale use signals in the millivolt range. This signals must travel over fairly long wire lengths. These wires can act as an antenna for any type of electronic signals that may be in the area. That will cause distortions to the desired signals, and errors in the weight results. To avoid these problems, cylinder scales of this type should be designed with very extensive shielding and filtering. An excellent first step is to use stainless steel for the construction material of the entire scale. Stainless steel has very good blocking properties. Arlyn Scales places their stainless steel load sensors inside stainless steel tubes in the frame of the scale. The ends of the tubes are closed with a stainless steel plate. The plates are attached to the tubes with a continuous stainless steel weld. All of these efforts will provide extensive shielding for the load cells and load cell cables. The load cells themselves should be carefully grounded to the stainless steel frame. A braided copper strap is used for this purpose. It is bolted to both the load cell and the frame with stainless steel hardware. The load cell cable running internally in the tubing is wrapped around a ferrite core. This also helps to attenuate interference signals. The access to the load cell is covered with a removable stainless steel plate, which is also bolted to the tubular frame. Graphite impregnated gasket material is used to ensure excellent contact between the plates and the frame. The scales must output the weight information to other process equipment that will monitor this weight. A standard method of communication is a 4 Ð 20 ma current loop. The cable that runs out of the scale is also susceptible to interference signals. Again, a ferrite core is used to suppress this interference.